The Connecticut State Police Academy Alumni Association actively reports association news and upcoming events of interest for both members and the general public. The CSPAAA also offers valuable resources including a listing of Connecticut State Police locations and links to law enforcement-related sites. 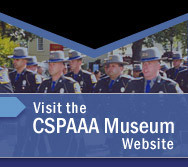 View the CSPAAA Calendar for sponsored events and activities as well as upcoming state police events and activities. CSPAAA shares news and press releases online that will benefit both members and the general public. CSPAAA provides contact information for state police troop and administrative locations. CSPAAA provides links as a reference tool for our members and the general public.